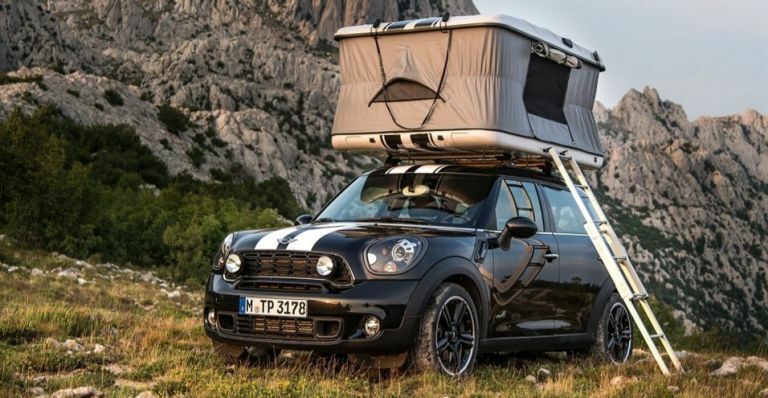 If you're someone who loves camping in the great outdoors and you just happen to own a Mini Countryman (or you're in the market for one), Italian firm Autohome might just have the ultimate accessory for you - an AirTop tent that fits and opens right on your roof of your motor. The new 2017 Countryman is bigger than ever so while new feature might seem a little odd, it's perfectly suited to this rugged roadster.The roof tent includes a high-density mattress with cotton cover, two doors and two windows with zips, close-meshed mosquito nets at all openings and a battery-operated LED interior light, as well as luggage nets and pockets to stow personal items. You even get a lightweight aluminium ladder to help you get up and down to your new elevated abode. The tent fits onto the roof rails of the car and folds down into a regular looking roof box when not in use. You can order an AutoHome AirTop Roof Tent today in either black or white for only £2,400. Hot on the heels of the 'low and slow' smoking craze that's taking the United States by storm, one of the nation's biggest gas grill brands is finally bringing one of its easy-to-use electric smokers to the UK. The Char-Broil Smoker is ideal if you're looking for tender smoked ribs, pulled pork, the perfect smoky ribeye steak or delicately-flavoured smoked fish. The digital high-tech smoker is a great addition to any garden or patio as a first or even second grill. The Smoker doesn’t take up much space and can easily be moved around on its wheels to any convenient spot. And despite its compact size, it can easily handle large quantities of meat or fish on up to four stainless steel grates. You can easily control the temperature between 37.7°C and 135°C and the patented smoke chamber via a handy little LED panel and its high-capacity wood chip box provides up to six hours of smoking in one go. The Chair-Broil Digital Smoker is available now for only £349.99 from most BBQ equipment stockists and retailers. Originally designed and sold as a limited edition set for charity (in which it raised nearly £27,000), the Cambridge Audio SE1 headphones are now returning for a full retail run in the UK. The SE1 headphones offer a clear and clean signal thanks to the use of a rather rare material known as beryllium, which the firm uses in the diaphragms of the specially developed 8mm speaker drivers. Beryllium is an ideal material thanks to it being lighter than aluminium while stiffer than titanium (it's also exceptionally well damped, minimising any unwanted ‘ringing’). These high-end in-ear headphones are a seriously swanky bit of kit, offering comfort, style and durability. The Cambridge Audio SE1 headphones are available now via the firm's online store, priced at £68.